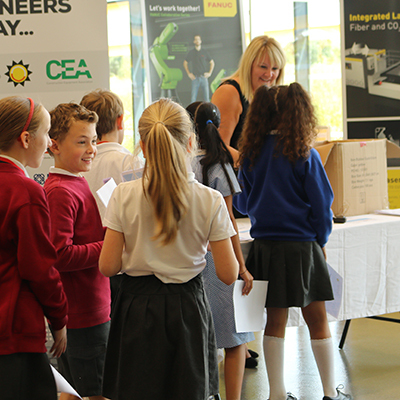 Local children from two primary schools in Coventry and Southam were given the chance to meet industrial robots for the first time as part of an event organised by national awareness programme Primary Engineer and hosted by FANUC UK. Around 20 pupils, aged between eight and ten, from The Dassett C of E Primary School, Southam, and Wheelwright Lane Primary School, Coventry, were invited to FANUC’s purpose-built facility in Ansty Park, Coventry, on the 11th July to see first-hand what future careers in engineering could involve. The children also used FANUC’s showroom to race soapbox cars that they had constructed with the help of their teachers and advisors at Primary Engineer. The cars were judged on aspects such as design and distance travelled, with the winners receiving medals and certificates from FANUC UK’s Sales and Marketing Manager, Andrew Armstrong. “It was great to see the children enjoying our facility and the robots on display,” he says. “They had clearly put a lot of effort into designing and building their cars and were very proud of what they had achieved." Getting up close and personal with FANUC’s distinctive yellow robots certainly seemed to excite the children, with the LR Mate golf putting cell proving to be a particular favourite. For their teacher, Rachel Williams, who is also the Science Lead at The Dassett Primary School, events such as this one provide the children with much-needed experience of what engineering and manufacturing means today. The event, which took place on Wednesday 11th July, was organised by Primary Engineer, a national programme that aims to bridge the gap between industry and education through events, competitions and training. If you are interested in hosting an event at FANUC’s facility, or would like to arrange a visit, please email marketing@fanuc.co.uk. For more information on Primary Engineer, please visit www.primaryengineer.com.